Brumback Library in Van Wert. 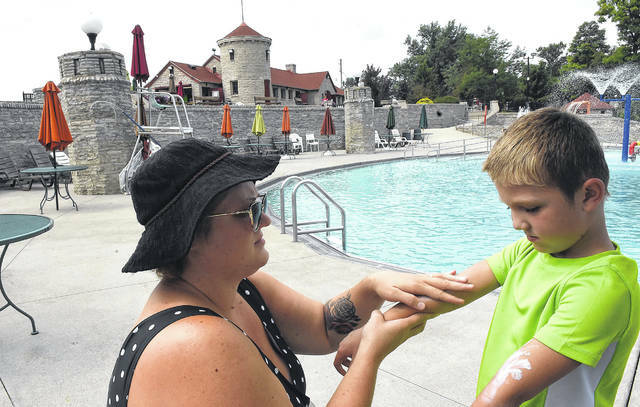 Stacey Amstutz of Findlay, rubs sunscreen on her son, Sawyer, 6, before swimming at Columbus Grove Municipal Pool. Fiction area at Brumback Library in Van Wert. Non-fiction area at Brumback Library in Van Wert. Sawyer Amstutz, 6, of Findlay, swims at Columbus Grove Municipal Pool on Friday. 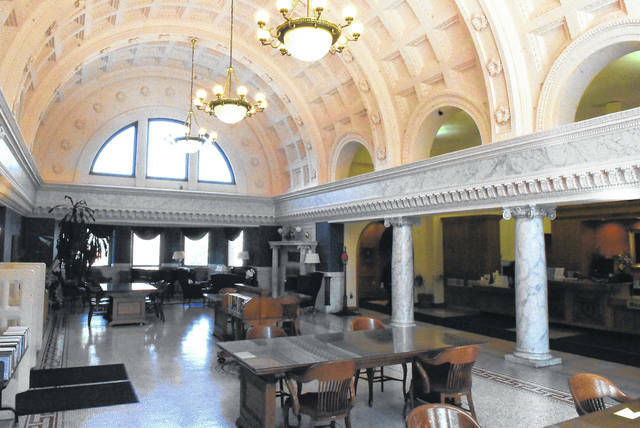 LIMA — The region is full of historical sites and buildings on the National Register of Historic Places that are still being used for their original purposes. 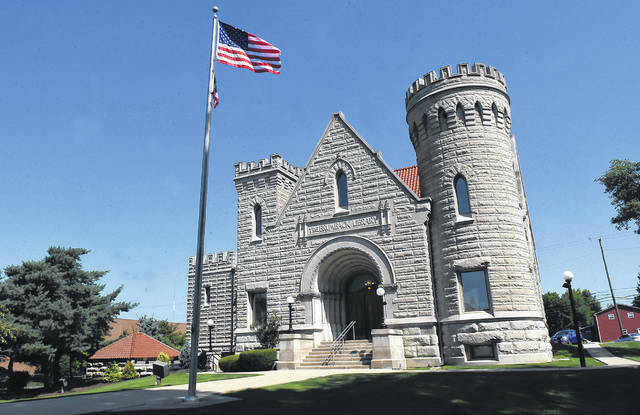 There are three buildings in the region on the register, aside from public buildings and houses: Brumback Library in Van Wert, Columbus Grove Municipal Pool and the Ohio Theatre in Lima. Construction of the Ohio Theatre in Lima was completed a few months after it began in 1925. Though the building has changed hands between corporations and private citizens over the nine decades it has always been used as an entertainment venue. Brumback Library was conceived by John Sanford Brumback, a businessman who moved to Van Wert from Illinois in 1862. Twelve Van Wert women founded the Van Wert Ladies Library Association, a subscription library for area residents, in 1890 and Brumback was a financial supporter of the library. 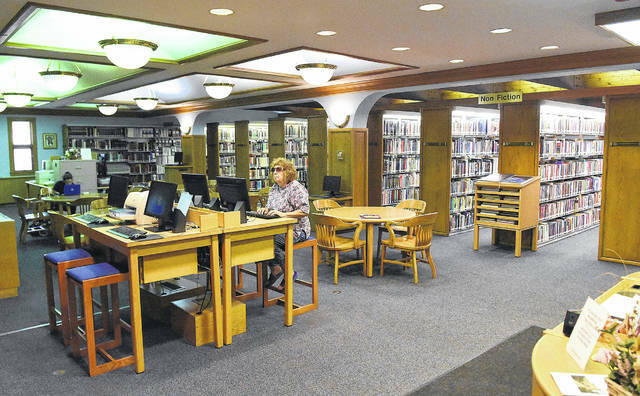 “Brumback wanted a library to serve not just Van Wert but the entire county,” Carr said. Brumback Library was designed by Toledo-based architect David L. Stine, but Brumback died before the plans were complete. The library was built by J.S. Zook, of Van Wert, with construction starting in 1899 and the dedication happening in 1901. 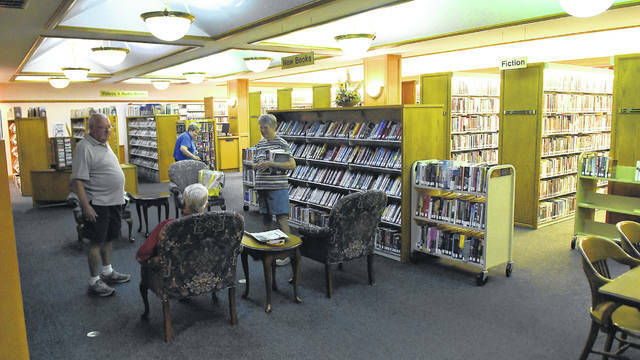 The Van Wert Library Association donated its books to the library and ceased operation. The library is designed like a castle, which was Brumback’s intention, Carr said. Even the yard in front of the library slopes and forms what is essentially two dry moats, which are not so dry when the neighboring creek floods, he said with a slight smile and chuckle. He said the library has gone through two renovations since its construction. In 1917, the basement was remodeled for a children’s department. 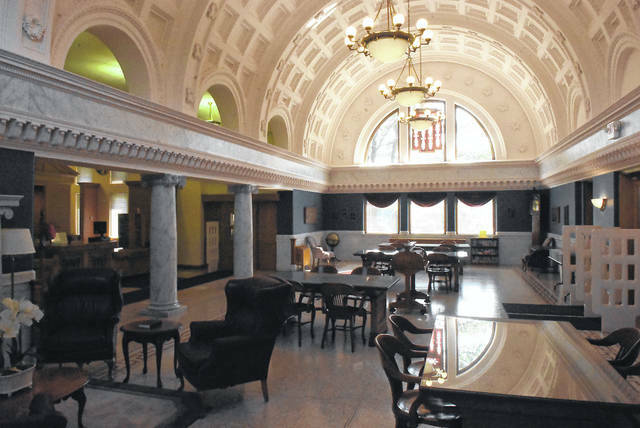 The second restoration occurred in 1991 with a 10,500 square foot addition. Brumback’s grandchildren, Orville and Ellen Reed, donated $2.5 million to the library for the project. The stone and roof tiles were both purchased from the same companies which provided the materials for the original library when it was constructed so everything blended seamlessly, Carr said. The interior addition blends with the interior of the original library as well. The first room visitors see when they enter the library, the reading room, has an arched ceiling with chandeliers. An assortment of tables and chairs with grand piano fill the room. Decorative florets stretch around the arch ceiling at intervals marking where the lights had originally been in the room. “It was the first building in town, outside of the courthouse, that had electric lighting,” Carr said. Weddings and memorials have been held in the reading room over the years, he said. Brumback Library has a children’s summer reading program which has been in place for 104 years. This summer, 1,600 children participated, Carr said. Various clubs are also offered. Families have been known to have portraits taken on the steps of Brumback Library. More children’s events are held in the addition basement, where the children’s section of the library is. The shelves in the children’s department are packed full of books with a variety of stuffed animals standing guard on top of the shelves. Carr said there are over 58,000 items for children. Maintenance of the structure and its usefulness is very important to Carr and the board of trustees. Nine staffers and 38 volunteers help with day-to-day operations. The Columbus Grove Municipal Pool is a product of Franklin D. Roosevelt’s WPA program during The Great Depression. The project employed 15 to 20 area men and two women from 1935 to 1937. The pool celebrated a grand opening on July 1, 1937. It was the first, and only, public pool in Putnam County until 1958 when a pool was opened in Continental. The limestone used to build the pool was taken from the stone quarry beside it on Road 8P. The stone was harvested and shaped on site by hand. The men and women working on the pool were not skilled laborers, instead learning the trade as they worked. The wage was 33 cents an hour, and according to a CPI Inflation Calculator on data.bls.gov is the modern equivalent of $5.99 an hour. Columbus Grove resident Brenda Watters-Davis has a personal connection to the pool. Her great aunt Tommy and great uncle Virgil Trask were two of the workers who built the pool, she said. She has many memories associated with the place. She said dances would also be held out there and other events. This was before chlorine requirements and the water was green, she said. At one time paddle boats were available in the water-filled quarry as well. 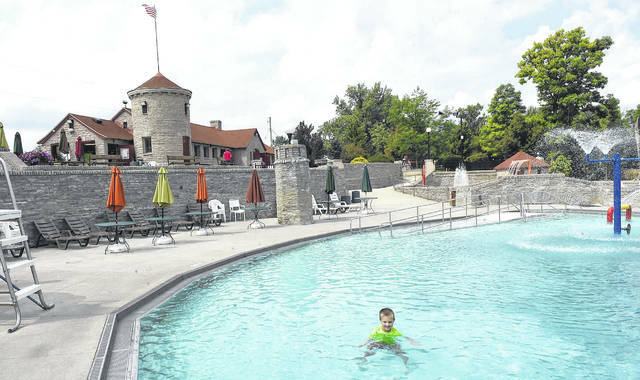 The Columbus Grove pool was the gathering place not just for village residents but for people from all over Putnam County, Watters-Davis said. In the winter, children and adults would ice skate on the frozen quarry. By 1996, a crack had formed in the retaining wall separating the pool from the quarry and the two bodies of water cross contaminated each other, said Ken Wright, Columbus Grove mayor. In order to save the pool, Watters-Davis worked to have the structure placed on the National Register of Historic Places while fundraising began. Wright said a levy was placed on the ballot 14 years ago for pool renovations and was passed with a great deal of public support. During the renovation, which began in 2003 and completed on May 22, 2004, the retaining wall was patched and a fence was put on it so people couldn’t sit on it between the pool and quarry. The baby pool, which had been a feature of the original pool, was filled in with concrete and turned into a splash pad, he said. A new pool was installed inside the larger, deeper original pool and the diving boards were replaced with water slides, Wright said. The levy that provides funding for the renovation will end this year, and a new 1 percent income tax parks levy will be proposed to replace it, he said. The Ohio Theatre was originally owned by Schine Circuit Inc., the company it was originally constructed for. Construction on The Schine’s Ohio Theatre took five months and cost $450,000, which is the equivalent of $6.5 million in 2018. The first show was Nov. 17, 1925. In February 1950, Broadway starlet Tallulah Bankhead performed in a single showing of “Private Lives,” at the theaters. Not only was Bankhead involved but the entire 1948 Broadway cast came to Lima to perform the show, giving residents a little taste of New York culture. In September 1978, The Ohio Theatre was deteriorating and the company which owned it at the time, RKO-Stanley Warner Group, chose not to renovate the theater and opted to close the doors. A local businessman, Larry Comer, purchased the theater from the company, renovated it and reopened it during an invitation only premier event on March 2, 1979. An story on the event from The Lima News has a photograph attached showing electricians working to get the lighting to operate correctly hours before the event was to begin. Comer turned The Ohio Theatre into a nightclub in the 1980s and hosted performers like Cheap Trick. In 2013, Mike and Kelly Saddler purchased the theater, renovated it to bring out some of the old architecture inside and held events like comedy nights, teen nights and even reached back into the reason the theater was originally built and staged some plays. The National Register of Historic Places is full of listings for buildings that have been torn down or left vacant to deteriorate over the decades. The Brumback Library, Columbus Grove pool and The Ohio Theatre have stood the test of time and still remain as symbols for their communities.